Making Classrooms Better - Description | W. W. Norton & Company Ltd.
Learning specialist Leslie Hart once wrote that designing educational experiences without knowledge of the brain is like designing a glove without knowledge of the hand. 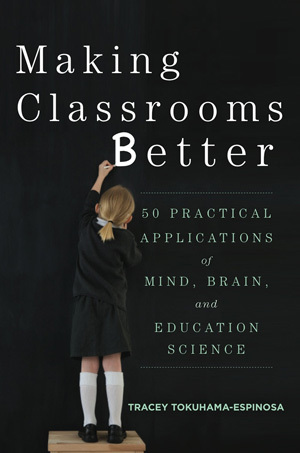 Making Classrooms Better takes this concept a step further, building from general knowledge of brain-based education science and current educational research to offer specific suggestions for how teachers can improve student learning outcomes. Covering a range of subjects, from creating an optimal classroom climate to maximizing metacognitive skill development, this well-researched, state-of-the-art guide is an essential resource for highly effective practices that teachers, administrators, and curriculum planners can easily use. The first half of the book provides a practical overview of teaching from a Mind, Brain, and Education perspective through an understanding of the intersection of the fields of neuroscience, psychology, and pedagogy. The second half shares 50 evidence-based classroom “best practices” that have a proven positive impact on student learning outcomes and explains why they work.